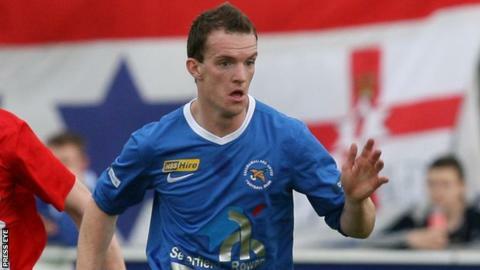 David Kee's 68th-minute goal earned Ballinamallard a deserved Premiership victory over bottom clubs Ards at Ferney Park. Kee missed the best first-half chance and the Fermanagh side also wasted late opportunities to extend their lead. The winning goal came after Ards keeper Graeme McKibbin saved Kee's spot-kick but the Ballinamallard man was able to hammer the rebound to the net. The penalty was awarded after Andy Hunter was adjudged to have handled. Ballinamallard always held the edge in the contest with Ards largely restricted to a couple of half-chances. Mark Stafford went close for the Mallards early on with Ards defender David Armstrong clearing off the line. Kee wasted his his first-half chance as he stabbed wide from close range after McKibbin had failed to hold a high ball. On either side of the break, Ryan Henderson and Stephen Gordon went close for the visitors as Ballinamallard briefly wavered. However, Steve Feeney missed a Mallards chance before the home side took the lead on 68. As Ballinamallard tried to put the game to bed in the closing stages, Richard Leckey fired wide with McKibbin denying Stafford and Feeney then rattling the woodwork. Right at the death, Ben Roy went close for Ards but it would have been an injustice if Niall Currie's side had got anything from the game.